Each week, commenter RandBall's Stu (branding!) tracks down a former Minnesota sports figure about whom you might have forgotten. This works out well. Stu? Nickname: “Mad Dog,” due to his scrappy grittiness and/or gritty scrappiness. Take your pick. Claim to Fame, Minnesota: a power forward for your Minnesota Timberwolves from 2003 to 2009. Perhaps best remembered for his exuberant Mark Madsen-ness, or the one game, 7 years ago this very night, that he kept launching three pointers despite being Mark Madsen. He was eventually moved, along with Bassy Telfair and Craig Smith, to the Clippers for Quentin Richardson. Claim to Fame, Everywhere Else: had a noteworthy career at Stanford, where he collected multiple All-America and All-Pac 10 honors. He was drafted by the Lakers and won two NBA titles with them. His most visible contribution to these world championships was some of the worst dancing this side of the disco scene in Airplane. Where He Is Now: after a brief spell as an assistant coach for the D-League’s Utah Flash, Madsen is now on Johnny Dawkins’ staff at Stanford. Is He on Twitter: yes. Has He Been in a Twitter Fight with Patrick Reusse: no. Glorious Randomness: the details of the Mad Dog 3-Point Game are almost disorienting. Minnesota’s high scorer: the late Eddie Griffin. Meanwhile, future former Timberwolf Brian Cardinal led Memphis in points. 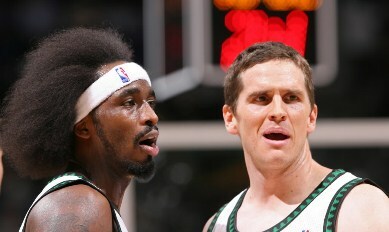 Kevin Garnett and Ricky Davis were DNPs for Minnesota, while the Grizzlies benched Pau Gasol. Then, there’s this quote from then-coach Dwane Casey, proving that maybe his dismissal wasn’t quite as unjustified as many now believe: "There's been so much doom and gloom around here," Casey said. "There is a rainbow at the end of the storm." It’s now been seven years since he said that. The rainbow is taking its own sweet time getting here. Friday (The case of the trashed hotel room) edition: Wha' Happened?